The PIP 34-874 is a 100-percent silicone-free work glove that ensures high-precision handling in dry environments – it’s well-suited for construction, plumbing, assembly, wiring, warehousing work and much more. Although 25-percent thinner than “standard” nitrile-coated gloves, the 34-874 provides excellent wear resistance, ensuring long-term use in heavy-duty work environments. The Ultimate 34-874’s micro-foam nitrite coating and micro-cup design provide a sure, controlled grip even when handling light oils. The material’s 360-degree breathability keeps hands cool and comfortable. Advanced knitting technology results in smooth, rounded fingertips and increased sensitivity. The glove’s design mimics the hand at rest, which reduces hand fatigue and optimizes comfort. 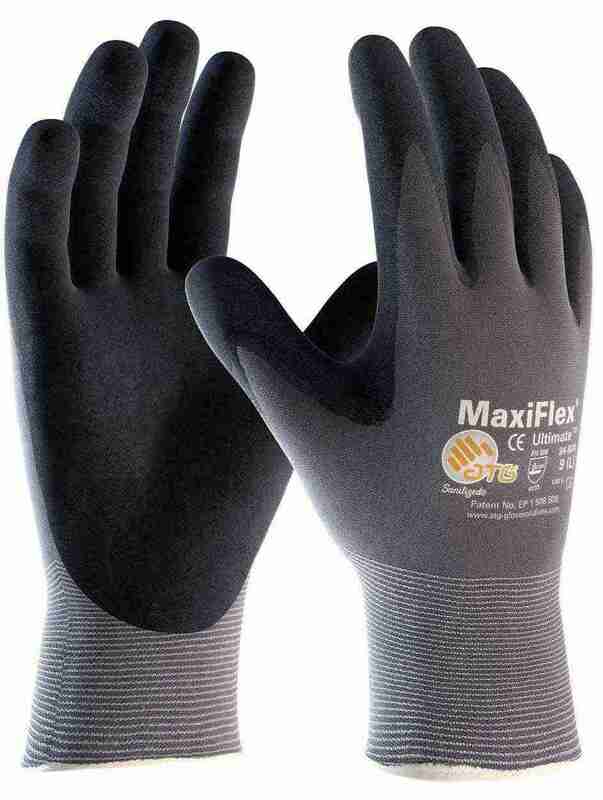 PIP MaxiFlex Ultimate 34-874 gloves come in sizes ranging from XXS to 3XL to accommodate every member of your workforce. Color options include black and yellow. PIP launders every pair before packaging to ensure they’re clean and safe to use. The Oeko-Tex Association certifies these gloves as harmless to the skin upon immediate contact. PalmFlex offers the PIP 34-874 glove for sale in bulk quantities — you’ll benefit from our volume discounts that can significantly lower your unit cost. We’ll also include free shipping within the continental U.S. with orders over $80 and a 30-day return policy for your peace of mind. Order your gloves online today or contact our customer service team for more information. This chart must be printed out to use. Please use the chart below to determine your accurate glove size for PIP.